carefully before using this website ('the Site'). These Terms and Conditions apply to all visits and use of the Site, as well as to the Content (as defined hereafter), information, recommendations and/or services provided to you on or through the Site. By accessing and using the Site, you signify your consent to these Terms and Conditions in their entirety in addition to any other law or regulation that applies to the Site, the Internet, and/or the World Wide Web. If you do not agree to these Terms and Conditions in their entirety please leave the Site. The Site is owned and operated by Mulcahy LLP All of the content featured or displayed on the Site, including, but not limited to, text, graphics, photographs, images, moving images, sound, illustrations and software ("Content"), is owned by Mulcahy LLP, its licensors and/or its content providers. All elements of the Site including, but not limited to, the general design and the Content, are protected by trade dress, copyright, moral rights, trademark and other laws relating to intellectual property rights. Except as explicitly permitted under this or another agreement with Mulcahy LLP, no portion or element of the Site or its Content may be copied or retransmitted via any means and the Site, its Content and all related rights shall remain the exclusive property of Mulcahy LLP or its licensors unless otherwise expressly agreed. The copyright in all Content is and remains owned by Mulcahy LLP Except as may be otherwise indicated in specific documents within the Site, you are authorized to view, play, print and download documents, audio and video found on the Site for personal, informational, and non-commercial purposes only. You may not modify any of the materials and you may not copy, distribute, transmit, display, perform, reproduce, publish, license, create derivative works from, transfer or sell any Content. Except as authorized under the law relating to copyright, you may not reuse any Content without first obtaining the consent of Mulcahy LLP For purposes of these terms, the use of any such material on any other website or networked computer environment is prohibited. You will not remove any copyright, trademark or other proprietary notices from material found on the Site. In the event you download software (including but not limited to screensavers, icons, videos and wallpapers) from the Site, the software, including any files, images incorporated in or generated by the software, and data accompanying the software (collectively, the "Software") are licensed to you by Mulcahy LLP. Mulcahy LLP does not transfer title to the Software to you. You own the medium on which the Software is recorded, but Mulcahy LLP retains full and complete title to the Software, and all intellectual property rights therein. You may not redistribute, sell, decompile, reverse engineer, disassemble, or otherwise reduce the Software to a human-readable form. 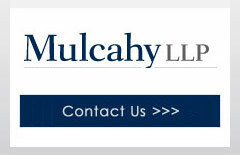 Mulcahy LLP DOES NOT REPRESENT OR WARRANT THAT THE INFORMATION AND/OR FACILITIES CONTAINED IN THE SITE ARE ACCURATE, COMPLETE OR CURRENT, OR THAT THE SITE WILL BE UNINTERRUPTED OR ERROR FREE, OR THAT ANY DEFECTS IN THE SITE WILL BE CORRECTED OR THAT THE SITE OR THE SERVER THAT MAKES THE SITE AVAILABLE ARE FREE OF VIRUSES OR ANY OTHER HARMFUL COMPONENTS. Mulcahy LLP DOES NOT MAKE ANY WARRANTEES OR REPRESENTATIONS REGARDING THE USE OF THE MATERIALS IN THE SITE IN TERMS OF THEIR CORRECTNESS, ACCURACY, ADEQUACY, USEFULNESS, TIMELINESS, RELIABILITY OR OTHERWISE, IN EACH CASE TO THE FULLEST EXTENT PERMITTED BY APPLICABLE LAW. Mulcahy LLP RESERVES THE RIGHT TO SUSPEND OR WITHDRAW THE WHOLE OR ANY PART OF THE SITE AT ANY TIME WITHOUT NOTICE WITHOUT INCURRING ANY LIABILITY. YOUR USE OF THE SITE IS AT YOUR OWN RISK. NEITHER Mulcahy LLP, NOR ANY OF ITS AFFILIATES, OFFICERS, DIRECTORS NOR ANY OF ITS AGENTS OR ANY OTHER PARTY INVOLVED IN CREATING, PRODUCING OR DELIVERING THE SITE WILL BE LIABLE FOR ANY DIRECT, INDIRECT, SPECIAL, CONSEQUENTIAL OR OTHER DAMAGES THAT RESULT FROM THE USE OF, OR THE INABILITY TO USE, THE MATERIALS ON THE SITE, INCLUDING DAMAGES CAUSED BY VIRUSES OR ANY INCORRECTNESS OR INCOMPLETENESS OF THE INFORMATION ON THE SITE, OR THE PERFORMANCE OF THE PRODUCTS, EVEN IF Mulcahy LLP HAS BEEN ADVISED OF THE POSSIBILITY OF ANY SUCH DAMAGES. PLEASE NOTE THAT SOME JURISDICTIONS MAY NOT ALLOW THE EXCLUSION OF CERTAIN DAMAGES, SO SOME OF THE ABOVE EXCLUSIONS AND LIMITATIONS MAY NOT APPLY TO YOU. Mulcahy LLP maintains the policy of not reviewing or accepting any unsolicited submissions of ideas, inventions, designs and/or other materials whether consisting of texts, images, sounds, software, information or otherwise (the "Materials") from persons external to Mulcahy LLP You should therefore not post any Materials on the Site or send these to Mulcahy LLP by e-mail or otherwise. In the event you do sent Mulcahy LLP any Materials, despite the request not to do so, Mulcahy LLP shall be entitled to use, copy and/or commercially exploit such Materials to the fullest extent and free of charge and Mulcahy LLP shall not be bound by any confidentiality obligation in respect of such Materials. Any issues involving this site shall be governed by the laws of the state of California and anybody using this site agrees that any lawsuit shall be litigated in state or federal court in California. If any portion of these Terms and Conditions become void, it will not affect the validity and enforceability of the remaining provisions. The void part will be replaced by provisions that are valid and have legal effect. Last revised March 24, 2011. Mulcahy LLP is a boutique litigation firm that specializes in representing franchisors, manufacturers, distributors, and other businesses.